For years, Rudolph the Red-Nosed Reindeer has brightened the holidays! Celebrating the special place it holds the hearts of Christmas lovers, Jim Shore reimagines the film's most iconic scenes in his signature folk art style. Rudolph leads the way as Santa's sleigh flies over a village, delivering toys to all the good girls and boys. Beautifully sculpted from stone resin, this folk art-inspired figurine features whimsical rosemaling and traditional quilt patterns. The handcrafted design is hand-painted in a soft palette of wintry hues. 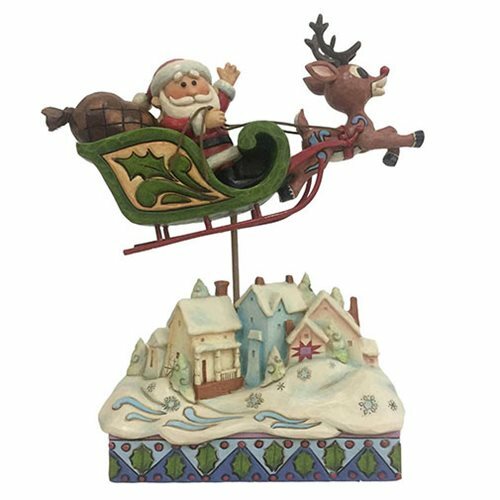 The Rudolph the Red-Nosed Reindeer Rudolph Sleigh Over Village Statue by Jim Shore measures about 7 1/5-inches tall x 6 3/10-inches long x 2 1/8-inches wide.